When you think of bananas, you think of monkeys. Right? Growing up in the 70s meant enjoying the ritual of watching Saturday morning cartoons for hours. And one of my favorites was the Tom & Jerry Grape Ape Show. Let’s have a watch (play the video below, folks)! So bananas. I was shocked this recipe listed the marshmallows as “optional” (really?) and that it didn’t call for the joy of the nilla wafer. Just make sure you include ’em both for an over-to-top old world tasty treat. 1. Whip cream in a mixing bowl. 2. Add the vanilla and whip some more. 3. Make the pudding per the box instructions. 4. Fold in the cream. 5. 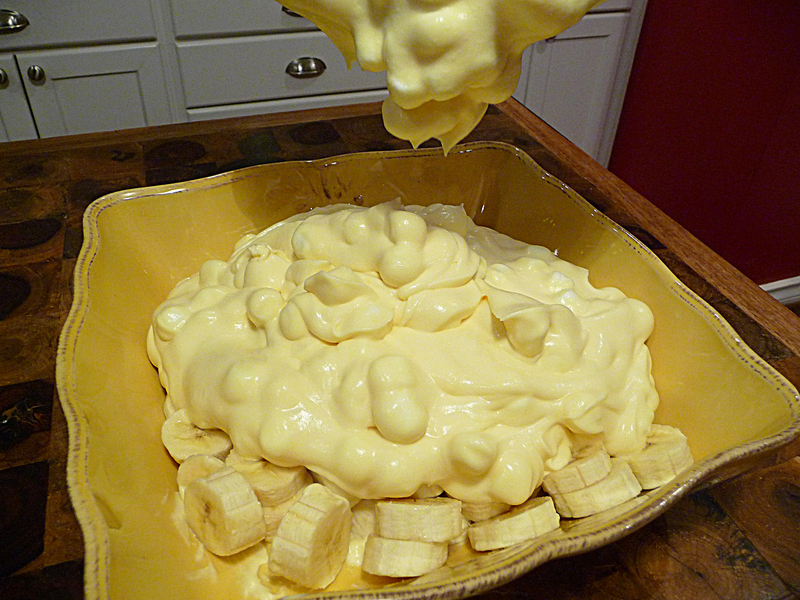 In a serving bowl, pour the cream-pudding batter over sliced bananas and chill for an hour or so. Serve from the casserole dish or spoon into individual custard cups. Eat it up! If you’re lucky, it’ll all be gone before any bananas on top brown. 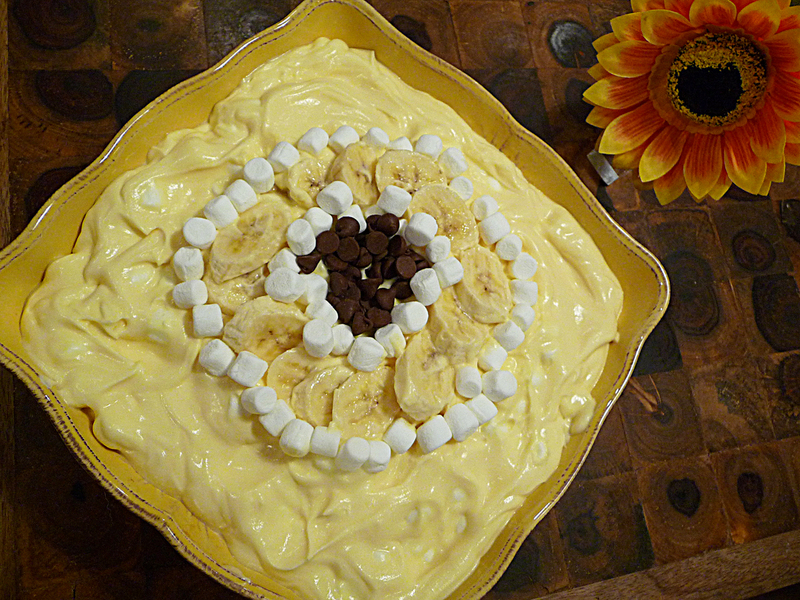 ♥ Get creative and find a way to decorate the top of your pudding masterpiece. I made a banana sunflower out of sliced bananas and chocolate chips. Or, at least I tried to! ♥ Nilla wafers. On the top. “Chunky crush” ’em first. ♥ No nilla wafers? Mom would approve of some chopped Texas pecans, y’all. ♥ Do you go bananas for bananas? Click here! Then scroll down to your heart’s content. Fresh From The Family Archives! My cousin Julie revved-up her scanner and shot me some recipes from her San Antonio kitchen last week. 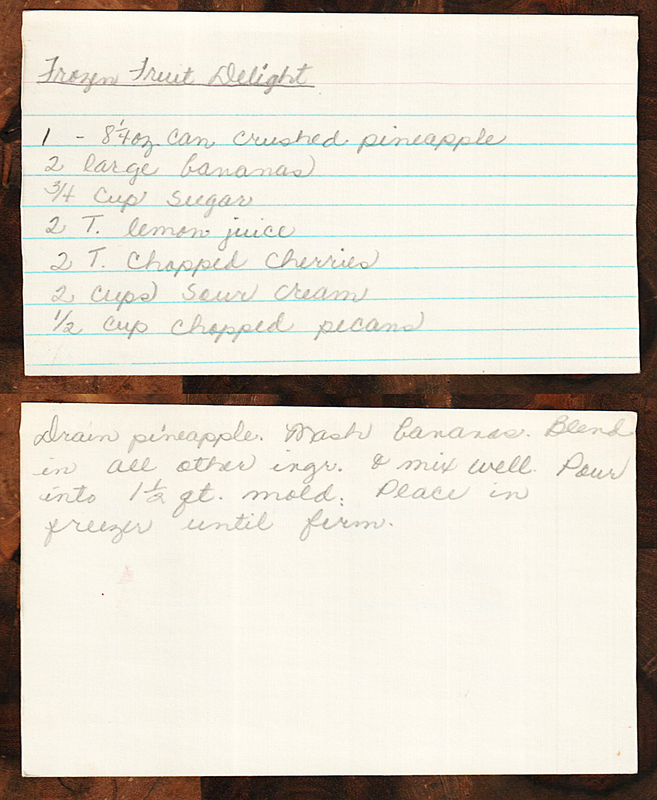 This tasty banana nut loaf cake recipe was one of them… and hailed from Delores’ kitchen (her handwriting is shown on the recipe below). 0. Soften your butter. See tip below! 2. In a large bowl, mix the first five ingredients. 3. Dissolve the soda in the buttermilk; add to the first five ingredients. 4. Mix the flour with the baking powder; add to the ingredients along with the vanilla and mix well. 5. Grease the bottom of a loaf pan (roughly 8.5″ x 4.5″ x 2.75″) then line the bottom of the pan with wax paper. 6. Pour batter into baking pan and bake at 350°F for 1 hour and 15 minutes. ♥ Ahhh, softening butter. I’m usually in the heat of the moment before I realize I need room temperature butter but it’s still in the fridge! If you’re short on time and can’t wait the 30-60 minutes for your butter to soften on the countertop, here are some helpful tips for how to accelerate things. I usually cut the butter into 1/2″ slices and set them near my preheating oven and usually in about 15 minutes things are ready to roll. 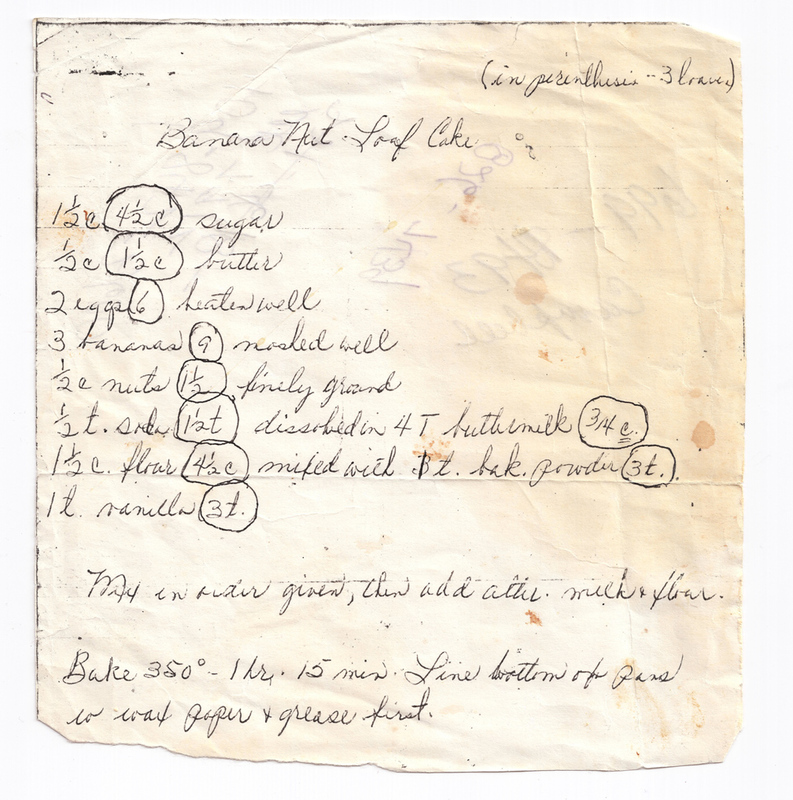 ♥ This recipe was surely a family favorite ~ the measurements for how to make *three loaves* is noted in the original recipe below (see the circles)! 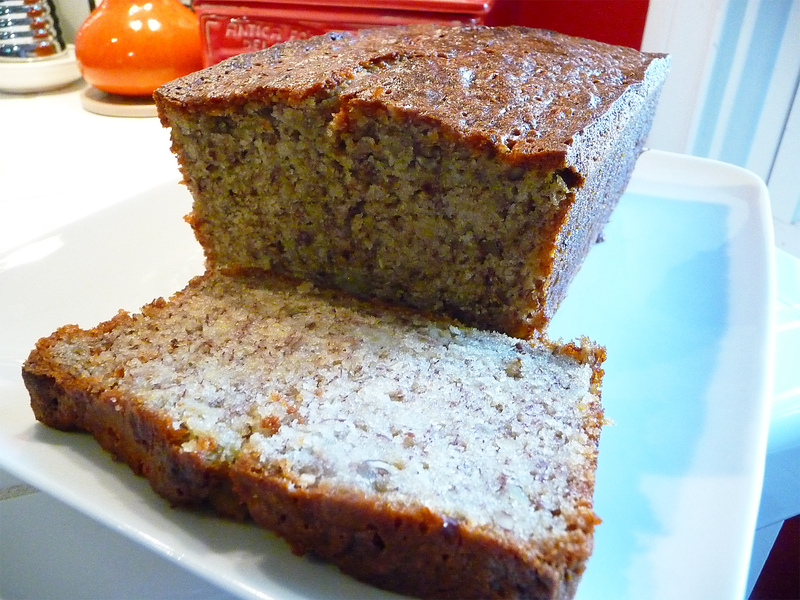 ♥ Julie says this recipe is a good use for almost-bad bananas. 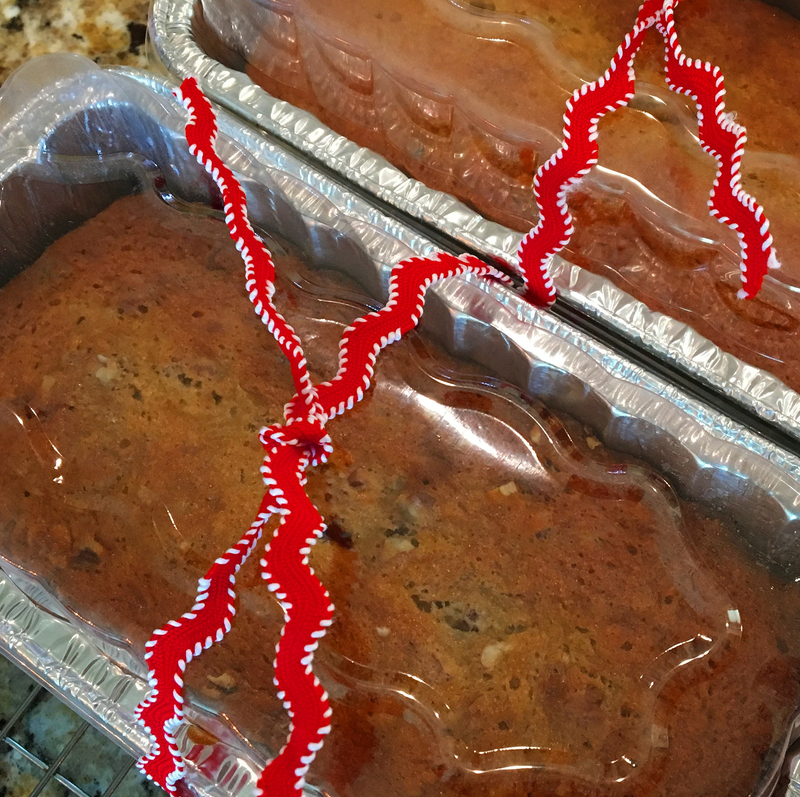 ♥ You can also split this into two smaller loaves. I used foil pans that were 8″ x 3-7/8″ x 2.5″ and kept one and gave one as a gift. ♥ Who’s Jeanette? Click here and learn more about Jeanette and her famous oatmeal cookies! 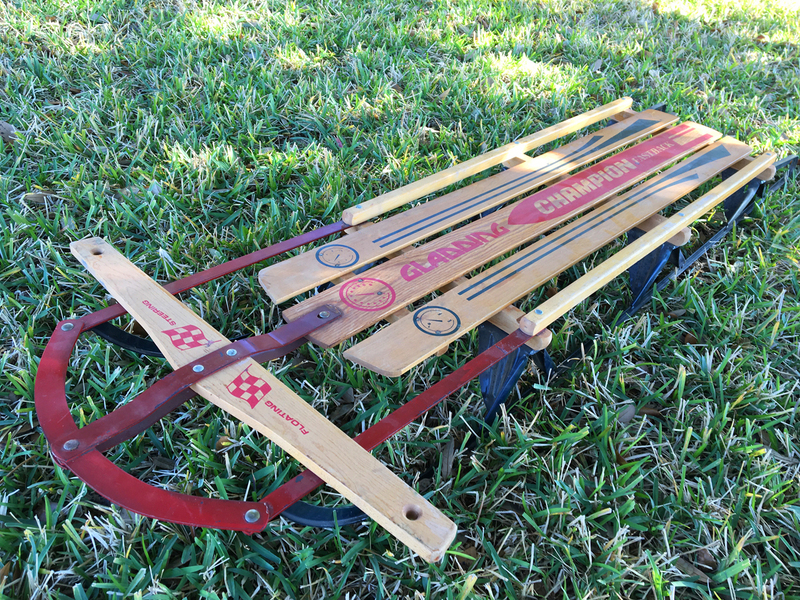 One of my favorite childhood memories was spent with Mom as we’d “will” snow to come for a delightful visit. During special winter nights, when the temperature dropped and the dark sky was fluffy white, we’d patiently sit together by the dining room window with the back porch floodlights aglow. We were watching the sky for flurries. While snow flurries didn’t arrive until I was 18 years old, this seemingly fruitless ritual instilled in me the basic belief of hope. Hope for a snowier tomorrow. And more importantly… the belief that something great was just around the corner… no matter how long it took to arrive. While the South Texas snowflake is a treasured rarity, the greatest of all snowfalls arrived in January of 1985. Still living at home with Mom, (she was a widow just 3 years young), we woke to discover a 13 inch snowfall in our Alamo City! It was like a Texans’ Colorado-loving dream come true. It was then I found my most favorite frozen delight. 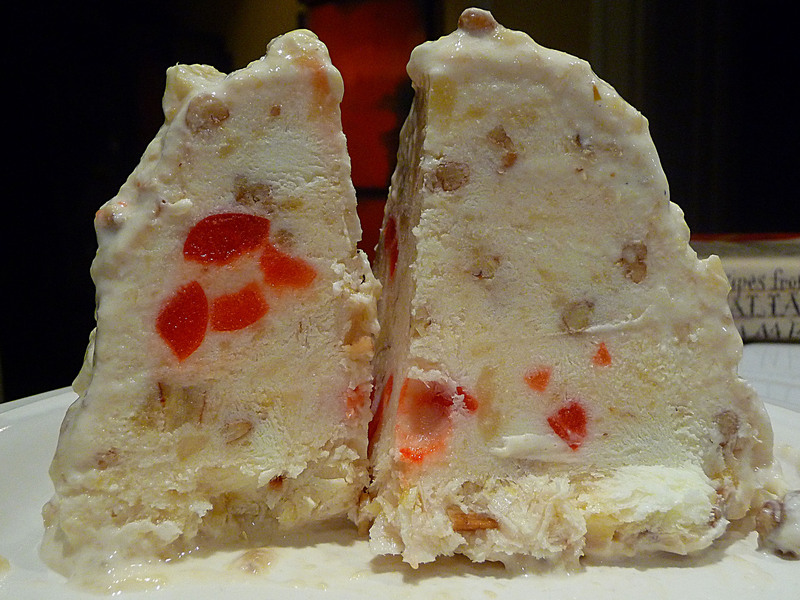 And now I share with you Mom’s culinary frozen *and fruity* treat, compliments of this recipe. Now you don’t have to wait for winter to muster-up your own frozen delight. 0. First find yourself a 1.5 quart mold. 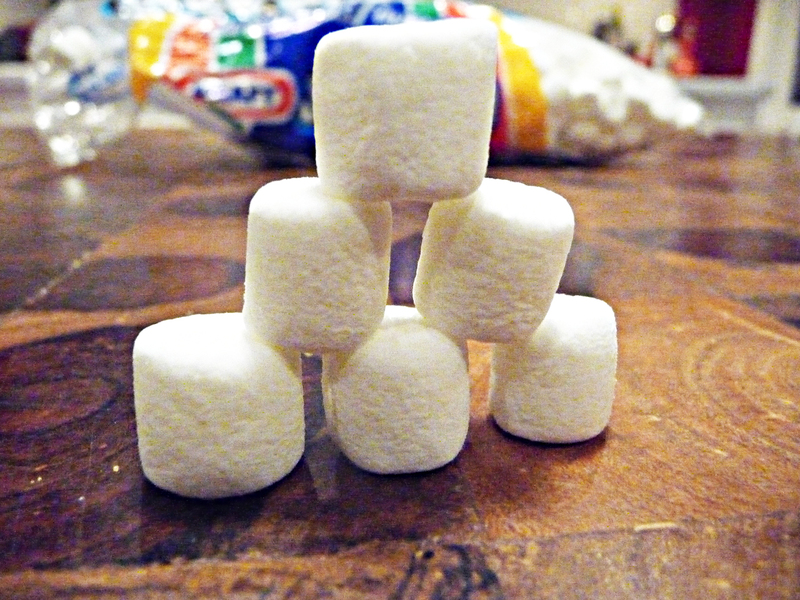 Since “quarts” aren’t referenced much these days, a 1.5 quart mold holds 6 cups. 1. Chop the cherries and pecans if need be and set ’em aside. 2. Drain the pineapple and dump the mixture into a medium-sized prep bowl. 3. Mash the banana and add it to the pineapples. 4. Mix in all of the remaining ingredients. 5. Pour the mixture into the mold and freeze until firm (about 4-6 hours). To serve, dip the mold into warm water a few seconds to loosen the frozen delight. Place an upside down serving plate on top of the mold… flip… and lift the mold up. If you’re lucky the delight will release from the mold and you’re ready to dig-in! This is an easy dessert to make with kids ~ a fine alternative to the hand crank ice cream machines used back in the 70s, when I was a tot. 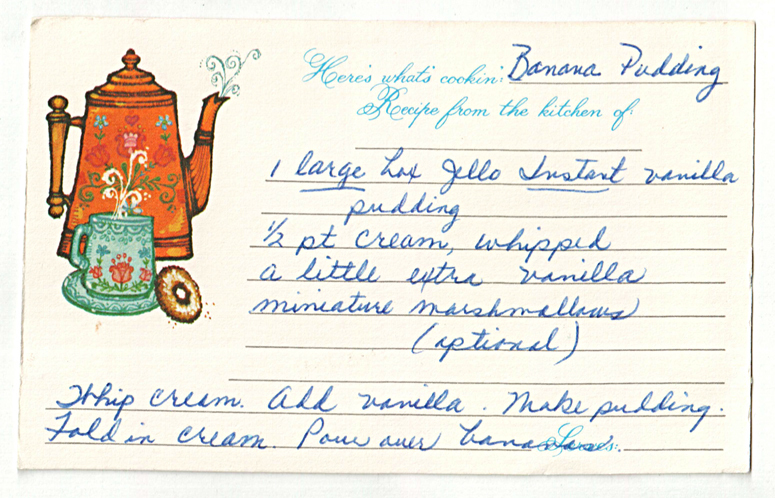 ♥ I’m sure Mom used jarred red maraschino cherries for this tasty dish. You can also use Amarena Fabbri wild cherries from Italy to spice this up a bit. And you can add a few more than just 2 tablespoons. For posterity. One of my earliest childhood memories was of my dad showing me how to transform a mere banana into an edible wonder… from skins to grins! This recipe is super easy to make and something you can share with your kids to teach them the simple art of food making. The best part? It’s a foodie favorite for any time of the day (or night)! 1. Peel the banana, cut off the ends and place it on a plate or in a shallow bowl. 2. Add 2 heaping fork fulls of peanut butter and top with a 4-6 second drizzle of your favorite local honey. 3. Smash all ingredients together with a fork and set aside. 4. 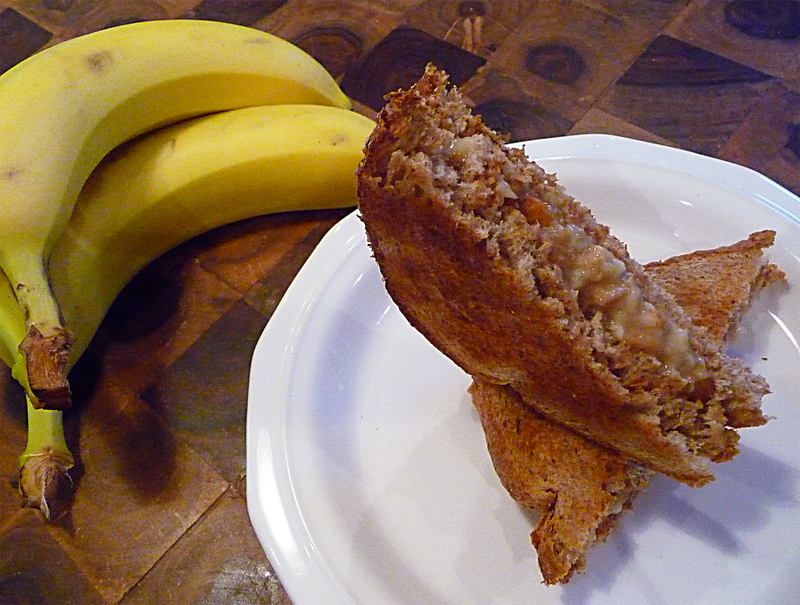 Toast the wheat bread; when done top one piece of the bread with the pb-banana mixture, add the last piece of toast on top and cut on the diagonal. Yields 1 heaping sandwich – or 2 more reasonably-sized sammies, if you add 2 more pieces of bread. ♥ Try toasting the bread last; eating the sammy warm makes it extra special.